(San Diego, CA)- There were a dozen teams from across California (9) and from outside of California (3) that participated in the 104th edition of the Sir Thomas Lipton Cup sailed in a fleet of matched J/105 one-design sailboats supplied by incredibly generous owners from the local J/105 fleet. As anticipated, the protagonists were going to be all Californian. In the end, the duel saw a few changes, with the primary actors this time being the local heroes (the San Diego YC team) pitted against a surprising newcomer at the top of this year’s leaderboard- the Long Beach YC team. In the end, it was a wild finish to the three-day series. Here is how it all played out. Southern California’s home teams showed true perseverance on the first day. 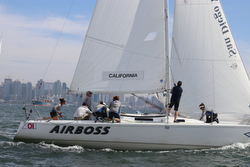 Five Southern California yacht clubs dominated the top of the fleet, despite some critical challenges on the course. With tight competition and teams finishing all over the score sheet, there’s no predicting the end of this regatta. The conditions on the beautiful, city front course in San Diego Bay were favorable. Light, easterly winds started off the regatta but the breeze quickly increased between 8-10 knots for the rest of the day. Sunny skies and flat waters made for a smooth day of sailing. Currently standing in first place is San Diego Yacht Club (15 points), followed by Long Beach Yacht Club in second (20 points) and Coronado Yacht Club (24 points) in third. Skipper Tyler Sinks was once again representing the San Diego Yacht Club. The team proved their experience in the regatta with a bullet in race one and race five. In addition to their first place finishes, SDYC stayed consistent at the top of the fleet for the entire day. Team SDYC is the current defender of the Lipton Cup trophy, having won last year’s event. Although SDYC showed an impressive skill set today, they had real competition against second place team, Long Beach Yacht Club. LBYC, skippered by Shane Young, had remarkable scores across the board starting the day with a bullet and a second, and finishing in third place in race four and five. The team would have finished first overall for day one if it wasn’t for a critical error in race three. “We averaged under fifth place, which was a goal of ours. I just had one incident resulting in a foul at the top mark that made it pretty difficult for us to recover. We had to do a couple spins to put us back. Other than that, we’re trying not to do anything too aggressive. We want to stay conservative and get off the line,” said Young. It was a busy day on San Diego Bay for day two. With a 580’ Bulk Carrier anchored directly in the middle of the course, U.S. Navy ships making their way in and out of the channel and the CRA Halloween Regatta interweaving, navigating through the course was nothing short of exciting. San Diego Bay was a spectator’s paradise. For the sailors, it was absolutely chaotic! The regatta started out under postponement due to fluky and light breezes. Around 1 pm, the breeze picked up to about 8-10 knots and stayed consistent enough to hold four races. Traffic on the Bay made for choppy conditions and many race course obstacles, testing the skills of our twelve Lipton Cup teams. “It becomes a safety issue as well. When there are a variety of boats on the course, crossing in each other’s paths, their unpredictable maneuvers make it hard for the boats racing to react. Today, we had to shorten the course, which gives the boat less time to separate and causes a crowd at the marks, making them more likely to collide,” Johnson continued. The current overall standings show Long Beach Yacht Club (32 points) in first, San Diego Yacht Club (35 points) in second and California Yacht Club (54 points) in third. Race finishes remained inconsistent all over the board with the exception of Long Beach Yacht Club who maintained their position in each race at the top of the fleet. Series race six started off with San Diego Yacht Club and California Yacht Club holding their positions at the top of the fleet at each mark rounding. Race seven saw two completely different teams take the lead, with Long Beach Yacht Club and Chicago Yacht Club dominating the majority of the race. Southwestern joined in the competition leading at every mark rounding alongside Balboa Yacht Club in race eight. With the exception of SDYC ahead of the fleet by a minute and a half in race nine, every mark rounding saw a new team on the quest for first. LBYC Skipper Shane Young talked about his success finishing first in day two. “It was all about staying in tune with your trimmers today. John Busch trimming jib was super communicative, talking a lot to me and keeping the boat up to speed through all the chop. The last three races saw breeze all over the map. Hitting shifts and keeping the boat moving through the chop and traffic was super important.” LBYC has stayed in the top of the fleet the entire regatta with an exception of a penalty in race three. California Yacht Club saw an impressive climb up the score sheet today, finishing the day in third place. Skipper Allie Blecher is a Lipton Cup veteran and was the first female skipper sent by CYC to the regatta. “We have the most amount of girls on board in the fleet and it’s really working out well for us. We’ve been spending as much time as we can out on the water together practicing.” Time in the boat has paid off for the California Yacht Club, who started the day with a second and finished with a third. The final day of the Lipton Cup started with gloomy skies and cool breezes around two knots resulting in postponement. 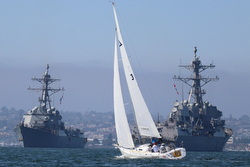 Traffic in San Diego Bay was limited, allowing for a wide-open course and minimal wake. Once the breeze picked up to over eight knots, the teams were ready to compete in their final day of races. The sun broke through the clouds and spectator boats surrounded the course in anticipation of the final results. 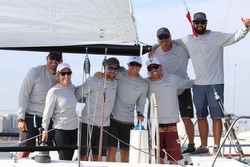 With only three races left to pull to the top of the score sheet, stakes were high on two teams in particular, San Diego Yacht Club and Long Beach Yacht Club. LBYC started off day three in first with 32 points followed closely by SDYC’s 35 points. Little did they know those three points would follow them to the last race of the day. Interestingly enough, neither team saw particularly great races today. SDYC’s third place in race 11 was the highest placement for either team all day. However, with incredible races on days one and two, the teams were able to hold their positions at the top of the fleet. The real race today was a match race between LBYC and SDYC. SDYC went into the final race of the day, race 12, with 48 points, three points behind LBYC. Crowds cheered the sidelines of the final race, watching both boats compete at the back of the fleet. SDYC finished in ninth place only beating LBYC by three boats. That was enough for the two teams to end the day in a tie at 57 points. Four bullets for SDYC determined that the tie breaker go to the home team. “It was a close race. Kudos to those guys for sailing a hell of a regatta. It could have easily been the other way around. It was high stress but we’ve been in these situations before and the guys were cool, calm and collected,” explained Sinks. LBYC Skipper Shane Young described the races behind the tiebreaker. “There were three races left and we knew we were tight with San Diego. It came down to one point over the whole regatta and losing the tiebreaker. It came down to the last leg and there were three boats in between us, giving them the points they needed. Congrats to them and hats off! Hopefully we can come back next year and we’ll be ready to rock and roll with you guys [SDYC]”. A notable connection between the two teams were their crews. 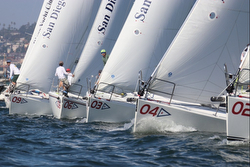 San Diego Yacht Club brothers John and Chris Busch raced head to head on opposing teams, SDYC (Chris) and LBYC (John). The brothers have been racing together for 45 years. They typically sail against each other in long distance races, but this weekend the two saw a friendly family rivalry. “We started out crewing in my father’s boat and eventually started sailing other boats. Chris went the professional route and I went to work, but still play on the weekends and have a great time. It’s really good seeing Chris do as well as he is throughout his professional sailing career. It’s a fun family rivalry and we’re still going to talk at Thanksgiving and Christmas!” John joked. John and Chris will be sailing against each other again in the 2019 Transpac. For more J/105 Sir Thomas Lipton Cup sailing information Add to Flipboard Magazine.